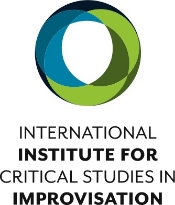 The International Institute for Critical Studies in Improvisation (IICSI)'s mandate is to create positive social change through the confluence of improvisational arts, innovative scholarship, and collaborative action. For the 2015-16 academic year, we invite applications of postdoctoral researchers for one residential fellowship. For the 2015-16 year, we particularly welcome candidates with expertise in pedagogy and curricular design who could contribute to the development of IICSI's graduate program in Critical Studies in Improvisation. The fellowship may be held at the University of Guelph, McGill University, or the University of Regina; this is a residential, not a remote, fellowship. Applications are due April 30th, and full submission details are available here. In IICSI’s home base, Guelph, ON, the new community space Silence continues to present important work. Upcoming concerts include a “Monk Marathon” starting at 1pm on Sunday March 22, featuring Jean Derome’s trio “Evidence,” the Toronto duo “Hat and Beard” with Ken Aldcroft and Dave Clark, and Toronto vibraphonist Michael Davidson. Visit Silence online. 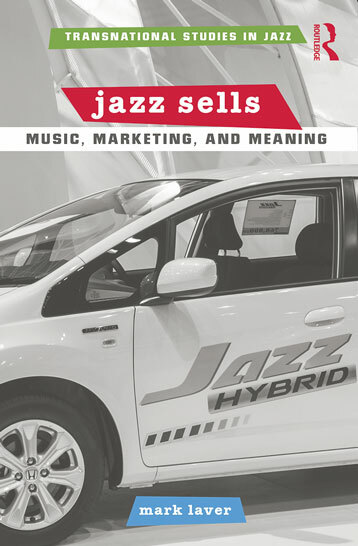 IICSI research associate, saxophonist and ethnomusicologist Mark Laver announces the publication of his first book, Jazz Sells: Music, Marketing, and Meaning (Routledge, March 2015). Professor Laver’s research focuses on the intersections among jazz, improvisation, and neoliberal capitalism. He is presently Assistant Professor of Music at Grinnell College. Jazz Sells is excerpted in the current issue of Ethnomusicology Review. From Tuscaloosa, Andrew Raffo reports that composer/saxaphonist/philosopher Anthony Braxton was artist-in-residence at the University of Alabama in February. The residency included "Falling River Music," a showing of Braxton's graphic music scores at the university art gallery, which included work by University of Alabama art students Ausharea Adams, Mitchell Friest, Brittany Gunnells, Ali Hval, Patrick O'Brien, Jennifer Ocampo, and Seth Saunders responding to Braxton's work. Braxton performed in a number of settings, including solo, trio, quartet, and septet; the University of Alabama Percussion Ensemble & Jazz Orchestra performed a concert of his compositions; and Braxton performed his "Pinetop Aerial Music" together with musicians and dancers. For more on the University of Alabama Sonic Frontiers Concert Series, please visit their website. March 8 was International Women’s Day and both Canada and the USA are celebrating Women’s History Month. From Indiana University, Monika Herzig reports that March includes performances by New York flautist Jamie Baum and continues in April with showings of the Kay Ray film Lady Be Good: Instrumental Women in Jazz. Dr. Herzig provides a link to a recent article in MEIEA, the Journal of the Music & Entertainment Industry Educators Association (Volume 14, Number 1 (2014): “Beyond Jamming: A Historical and Analytical Perspective on the Creative Process,” which she co-authors with fellow IU professor David Baker. Veryan Weston and Trevor Watts in Vancouver (2011). 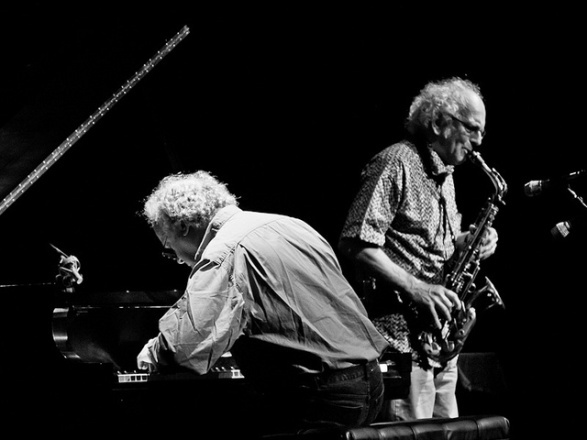 During April 2015, North American audiences will have the rare opportunity of hearing the British duo of Trevor Watts (saxophones) and Veryan Weston (piano). Trevor Watts is a central figure in European free improvisation; he was a founder, with John Stevens, of the Spontaneous Music Ensemble in the 1960s, and has been prominent in the London Jazz Composers’ Orchestra and his own African-influenced Moire Music. Veryan Weston is well-known for his work with Watts as well as Lol Coxhill, Eddie Prévost, Caroline Kraabel and Phil Minton. April 10 - Barking Legs Theatre, Chattanooga • 11 - Emma Bistro, Nashville • 12 - Sonic Frontiers Festival, U. of Alabama, Tuscaloosa • 13 - Shreveport (TBA) • 14 - U. of Arkansas, Little Rock: master class • 15 - U. of Arkansas, Little Rock: concert • 16 - Dreamland, Louisville KY • 17 - Conundrum, Columbia SC • 19 - Delta College, Michigan • 21 - Kerrytown Concert House, Ann Arbor • 22 - Robinwood Concert House, Toledo OH • 23 - Rochester NY (TBA) • 24 - Music Gallery, Toronto • 26 - Halifax NS (TBA) • 27 - Sala Rossa, Montreal • 29 - Rimouski Festival: master class • 30 - Rimouski Festival: concert. After several years at the online journal Critical Studies in Improvisation / Études critiques en improvisation, Michelle Peek is stepping down as Managing Editor. We thank Michelle for her excellent work in helping to bring CSI/ECI to the forefront of international discourse in this emerging field! The role of Managing Editor will be filled by Gregory Fenton, presently a third year PhD student at the University of Guelph in the field of Asian North American literary and cultural studies, and formerly Managing Editor from 2007-2009. RISC researcher Charity Marsh organized a March 8 workshop on "Fighting Monkey" movement, which stresses the role of improvisation and intuition in the body’s reaction to diverse and urgent situations. In pursuing Fighting Monkey Practice, "… we create moments of gesture, dance and survival; complex dimensions of movement are discovered rather than taught." Dr. Caines and researcher Helen Pridmore spoke on Regina’s community radio station CJTR about the importance of improvisation as part of "Cultural Connection," which runs every Tuesday (sponsored by RISC partner Common Weal). 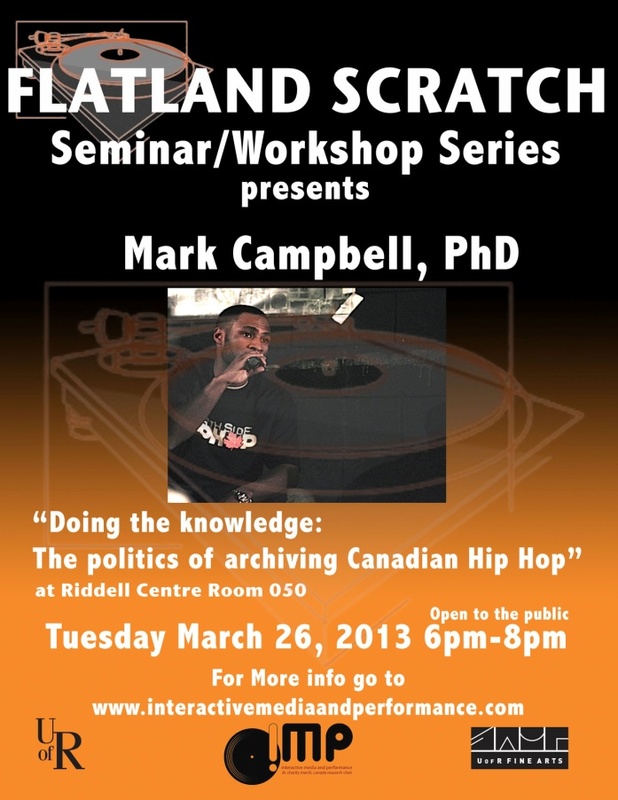 RISC researcher Mark Campbell presents "Doing the Knowledge: The Politics of Archiving Canadian Hip Hop" on Tuesday, March 26th at 6pm, as part of the Flatland Scratch Seminar/Workshop Series at the Interactive Media and Performance Labs. Researcher David Gerhard has joined IICSI's Digital Tools committee to help guide digital research into improvisation. He will also be working with students at University of Regina on his new interfaces for musical performance. RISC partners Wascana Rehabilitation Centre and the University of Regina continue their Improvising with iPads project with long term First Nations and Metis residents every Friday. A performance will be upcoming in the next month, and there are a number of research presentations on the project scheduled over the summer, directed by Rebecca Caines, Rick Kotowich and Amanda Schenstead. Jo-Ann Episkenew, from RISC partner the Indigenous People's Health Research Centre is working with RISC to start doing new research on IPHRC community art and health projects and has just employed a new student to help with artist interviews (watch this space!). Researchers Kathleen Irwin and Rebecca Caines are working on a panel on improvisation at the Performing Turtle Island conference at First Nations University in September. From Columbia University, Adam Tramantano reports the debut of a new open-access peer-reviewed scholarly journal on improvisation and work, The Journal of Improvisation in Professional Practice. “We publish scholarly articles that deeply inquire into improvisation in work as well as narratives from workers from all realms of vocation.” Published in partnership with the Center for Digital Research and Scholarship at Columbia University Libraries and Information Services, the Journal has issued its first Call for Papers with a deadline of June 20, 2015. For more information about the Journal’s focus and scope, and to view the Call for Papers, please click here. In this new Think Piece, Improvisation and Leapfrogging: The History of Improvisation in Toronto and the Episteme of the Twentieth Century, Mauricio Martinez interprets improvisation's history from a Marxist perspective. When improvisers talk about the beginnings of free improvisation in Toronto during the mid-twentieth century, they speak of a "leap-frogging" from older forms of jazz over bebop. In a grounded theoretical tour de force, Martinez outlines this act as a radical history movement. Dr. Mauricio Martinez has been producing documentaries and interviews for ICASP and IICSI since 2010. This Think Piece has emerged from his recent work researching the first wave of improvisation in Toronto, which is culminating into a documentary "Just Play: A History of Improvisation in Toronto" that is due to be screened in Guelph this spring. Pablo Vazquez. Photo by Javier Prazak. 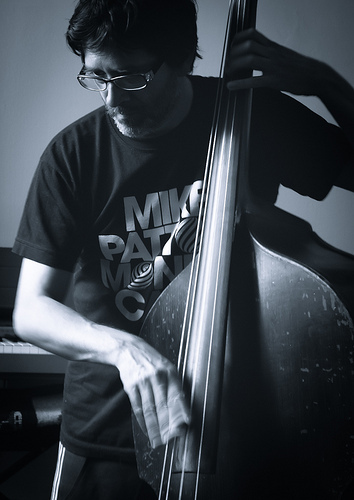 As we usually hear little or nothing about improvised music from South America, this issue’s Artist of the Month is Pablo Vazquez, double bass and electric bass player, composer and improviser. Born in Argentina in 1963, Vazquez is the founder of La Cornetita, the pioneering group of Argentinean improvisers who have been playing together since 1997. Vazquez has performed with renowned Argentinean improvisers such as Pablo Puntoriero, Nicolas Chientaroli, Enrique Norris, Augusto Urbini, Wenchi Lazo, Pablo Ledesma, and Ada Rave as well as with players from all over the world, like Frode Gjerstad, El Pricto, Diego Caicedo, Marko Jelaka and others. As a teacher, he is currently leading workshops dedicated to the practice of free improvisation in Buenos Aires. In 1961 I went, with the jazz musician Evan Parker, to a lecture on contemporary theatre given by Martin Esslin in Birmingham. At the end of the lecture Parker asked whether Esslin saw any future for improvisation in drama. Now, over twenty years later, his emphatic “No” seems, to say the least, hollow … at the time, the reasons he gave for his answer made perfect sense and were generally accepted by everyone in his audience. Improvisation could be of value in training and in education, he said, but as far as the formal disciplines of art were concerned, it was altogether too volatile a medium, too unstructured and too loose. Everyone agreed because, then, no one knew any different. If these ideas have lost their currency, it’s almost entirely due to [Mike] Leigh and is a measure of the originality of his contribution to our theatrical life. ―Paul Clements, The Improvised Play: The Work of Mike Leigh. London: Methuen 1983, p. 57. (Clements is writing about Mike Leigh, who for over thirty years has been bringing his improvised style of storytelling and performance not only to the theatre but to films such as Secrets and Lies, Vera Drake and most recently, Turner). Improv Notes was initially distributed in 2008 as a quarterly newsletter. From June 2011 until Sept. 2014 Improv Notes was assembled, written, and distributed on a monthly basis by Paul Watkins. As of October 2014 Improv Notes is edited and written by PhD candidate David Lee and assembled by administrative assistant Rachel Collins. If you have anything improvisation related that you would like included in the newsletter, please email icaspweb@uoguelph.ca.